2009 seems to be the year of the nesting cookset. A battle is brewing among gear manufacturers to see who can produce the slickest cookset that fits together like a backpacker’s version of a Faberge egg. 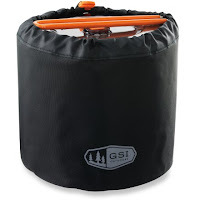 My personal favorite is the Pinnacle Dualist Cookset from GSI Outdoors. 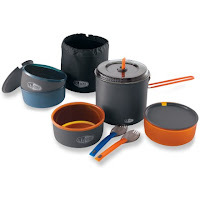 Designed for two people, this 20-ounce, $60 set includes a 1.8-liter pot and lid; two bowls; two (bowl-shaped) mugs with drinking lids and an insulated neoprene sleeve; two sporks; and a carrying bag that holds water to double as a kitchen sink. The sporks, cups, and bowls are two different colors, so you can easily keep track of which one is yours. 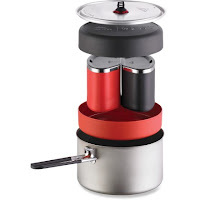 The pot also features an integrated handle that flips over the top of the lid for easy carrying—no need to worry about finding/losing/finding/dealing with a separate pot lifter. Overall review, two thumbs up. I particularly like the size of the pot, which is sufficiently large to cook for two people (or one big eater like myself). Though not an ultralight set-up, it’s not terribly heavy either. If you include a 3-ounce canister stove, the system weighs about 8 ounces more than a Jetboil PCS. The pot’s larger diameter (6.4 inches vs. 4.1 inches) makes it slightly bulkier than a Jetboil, but makes it much easier to cook things in the pot. GSI is also a winner when it comes to over-the-top marketing language for their products. You’ll be glad to know that the plastic lid is made from “Infinity” plastic. From their website: “A major leap forward in clean and green plastics, Infinity is an ultra-lightweight, completely recyclable, BPA-Free alternative to Polycarbonate resins. With exceptional clarity, jewel-like brilliance and 25% weight savings over Polycarbonate; its beauty is truly inspired.” GSI also uses “Radiance” technology in its pot: “The secret lies in a specially-formulated topcoat engineered to enhance heat dispersion and virtually eliminate hot spots.” So if you’re looking for specially-formulated, jewel-like brilliance that is truly inspired (and a great cookset overall), check it out! In competitors’ news, MSR has followed suit with its Exo 2 System. It’s slightly heavier (21.7 ounces) and twice the price ($12o) of the Dualist, but offers a larger capacity, 2.4-liter pot. Not a bad set-up, but not nearly as perfectly engineered as the GSI. I was also sad to find out that the Exo 2 is part of a complete overhaul and redesign of MSR’s cookset/pot line. The Blacklight cookset—one of the stalwarts of the industry and my set-up for the past many years—is no more.